Can anybody help me interpret this ? Does it really mean that 285 DIFFERENT people (or at least 285 different computers) have visited my blog in the past month ? I hope so! Yay Ellen! 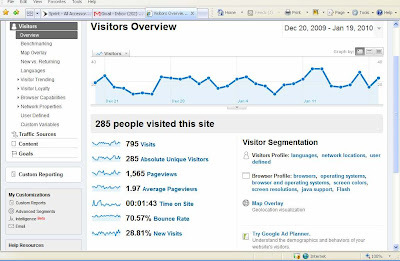 I have used Google Analytics before so I can figure it out if you need help! Yeah! That's good, right? You're like the really popular table at lunch at high school.